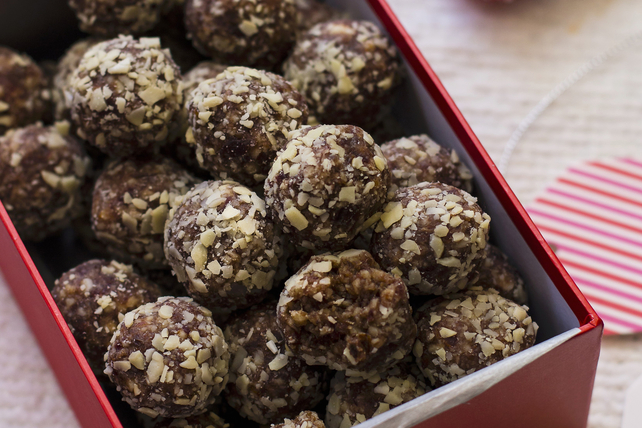 Melted chocolate, whipping cream and almonds are blended, shaped into balls and rolled in ground almonds for these decadent, yet easy-to-make, truffles. Microwave chocolate, butter and cream in microwaveable bowl on MEDIUM 1-1/2 to 2 min. or until butter is melted. Stir until chocolate is completely melted and mixture is well blended. Add 1/4 cup nuts; mix well. Cover rimmed baking sheet with waxed paper. Shape chocolate mixture into 24 balls, using about 1 tsp. chocolate mixture for each ball; place in single layer on prepared baking sheet. Roll chocolate balls, 1 at a time, in remaining nuts. Return to baking sheet. Refrigerate 1 hour or until firm. The chocolate mixture softens quickly. If it softens too much to easily roll it into balls, return it to the refrigerator to chill until firm before continuing to roll into balls as directed.